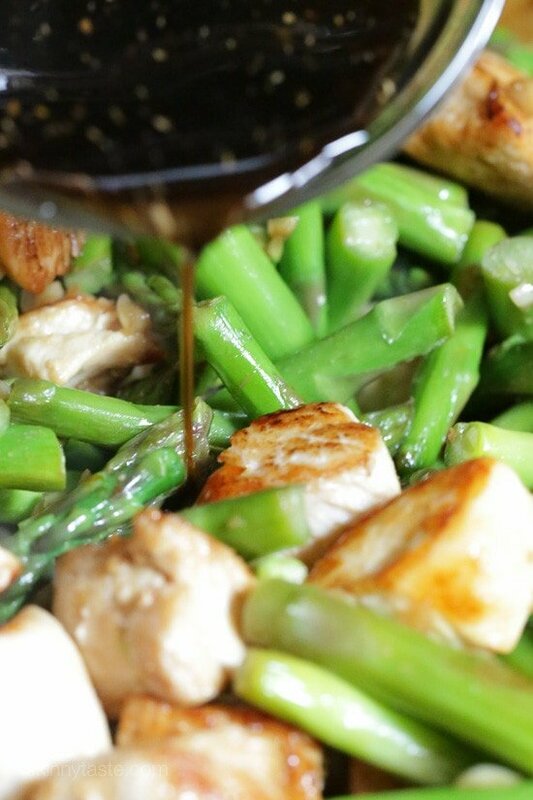 Spring is in the air and asparagus is season, which means I’ll be eating this Teriyaki Chicken and Asparagus Stir-Fry as often as I can, it’s one of my Spring favorites! 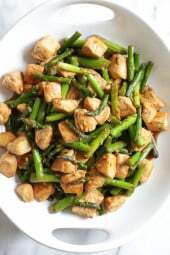 I shared this chicken stir fry recipe last year which is similar, only in a light lemon sauce and it’s been so popular, I thought I would create something similar, with a different sauce. I just love a stir fry that uses only one protein and one vegetable, perfect for a quick weeknight dish. March goals for me are to work out every day, and to eat less carbs this month (no, not giving them up completely). With that in mind, I loaded this dish up with chicken and asparagus so that portions are huge but if you wish to server this over rice this would easily serve six people. For more veggies add some sliced mushrooms with the asparagus. 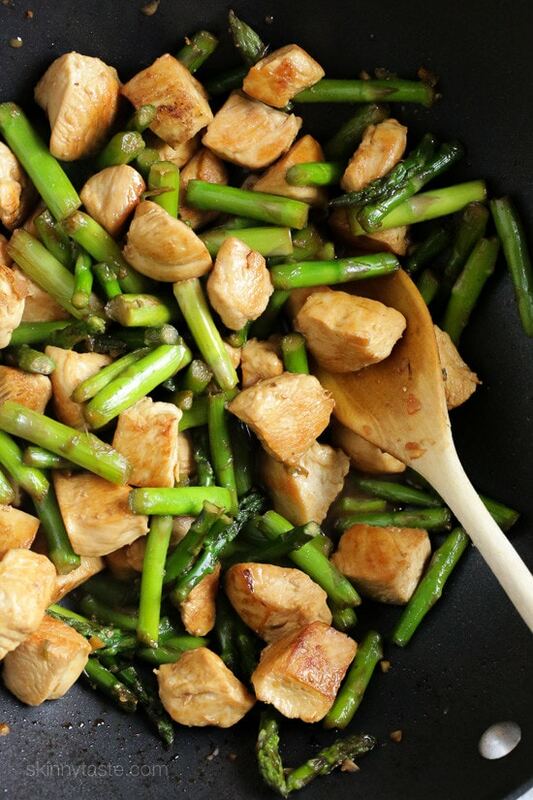 Swap the asparagus for 12 ounces broccoli florets in step 3 and steam 3 to 4 minutes. 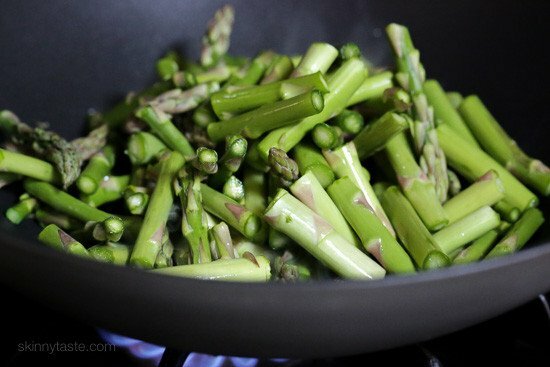 Swap the asparagus for 1 large zucchini, cut into 1/4-inch thick half moons and steam 2 minutes. Spring is in the air and asparagus is season, which means I’ll be eating is as often as I can, it’s one of my Spring favorites! 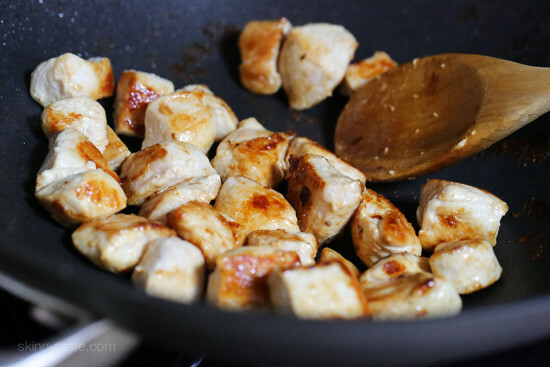 I love it paired with chicken in this stir fry! Heat a large non-stick wok over medium-high heat, when hot add 1 teaspoon of the oil, then add the asparagus and cook until tender-crisp, about 6 to 7 minutes. Add the garlic and cook until golden, about 1 minute. Set aside on a dish. Remove and set aside and repeat with the remaining oil and chicken. Place everything back into the wok, pour the sauce over and cook stirring 30 to 60 seconds until the sauce thickens slightly. How to Grow Your Love?